Ducati has taken the wraps off the 2014 Ducati 899 Panigale, which would be replacing the gorgeously built and performing Ducati 848 Evo. 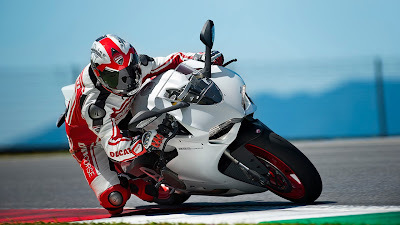 Design wise built on the same lines as that of the Ducati 1199 Panigale, the 899 Panigale is the little brother of the 1199 in every sense with the same frame less design and electronics aids, so much so that superficially, both the siblings look twins. The new 898cc "Desmoquardro" engine churns out 148bhp @ 10,750 rpm and 73 lb-ft of torque @ 9,000 rpms. But the difference between 1199 and 899 is not only in terms of capacity and performance numbers. Get under the skin of the 899, and the differences between the two siblings become more clear. Even though the 899 Panigale gets most of the electronic package from the 1199 Panigale, Ducati thought of holding it's horses for going out full blown (may be Ducati would come up with the "R" version of this which would be having the complete blast). The 899 doesn't get the Electronically Adjustable Suspension and is served by the traditional Manually Adjustable Suspension bits. Apart from the absence of Electronically Adjustable Suspension, the 899 does away single sided swing arm and gets conventional double sided swing arm,43mm Showa forks, Sachs mono shock and the lesser Brembo M4-32 brake calipers than the 1199 Panigale. With a Dry Weight of 168.9 kg and a Wet Weight of 193.0 kg is actually slightly heavy than the 848 EVO and also in terms of performance numbers, the 899 makes just 8bhp more and almost the same torque numbers. 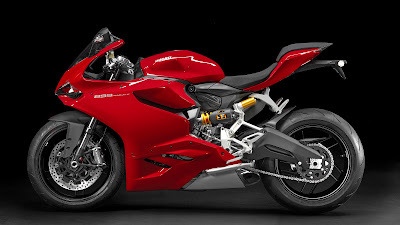 Therefore in my honest opinion, there's not much prudence for the existing 848 EVO to upgrade to the 899 Panigale so to speak, coming at a premium of around USD 1,000. All in all, the main differentiating element between 848 EVO and 899 Panigale would be how the 899 rides and that would actually allow a prospective buyer to buy or upgrade to the 899 Panigale. Ah... what is 73Lb-ft in Metric terms please?